Standard Tredda Plates are designed to protect pavements and other surfaces being damaged by steel base plates when scaffolding has been erected. Designed to fit on the ends of scaffold tube to protect both workers and pedestrians from bumps and scrapes. 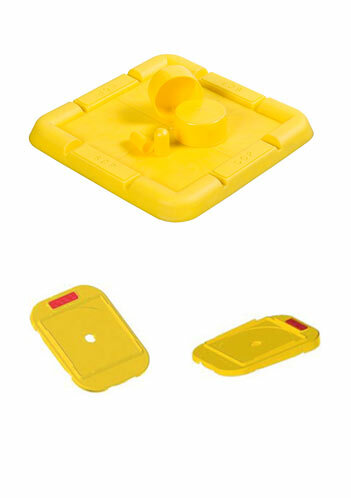 Designed to fit on Scaffold Fitting Bolts to protect both workers and pedestrians from bumps and scrapes. Specially designed for public areas, the deluxe tredda is a more hard wearing plate with raised edges to enclose the sharp edges of base plates avoiding injury to people passing through the scaffold. The inclined design of this plate enables it to be used on inclined areas such as hills and sloping surfaces – they can be stacked on top of each other for sharper inclines. Specially designed for public areas, the deluxe inclined tredda is a more hard wearing plate with raised edges to enclose the sharp edges of base plates avoiding injury to people passing through the scaffold.